A memorial to law enforcement and public safety personnel killed in the line of duty was dedicated Saturday morning outside the Buncombe County Courthouse. 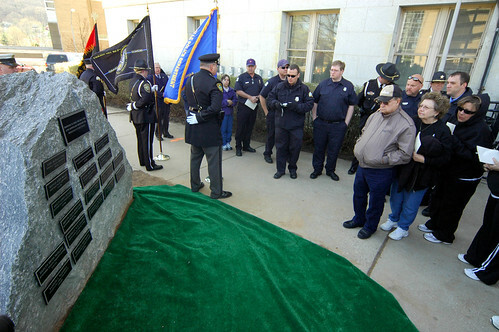 The memorial is an 8-ton piece of granite featuring plaques with the names of the dead. On a blustery, chilly morning, Buncombe County District Attorney Ron Moore and a host of police and fire officials, with help from the Patriot Guard Riders, held a ceremony to mark the event. The dedication was held on the fifth anniversary of the death of Jeff Hewitt, a Buncombe County Sheriff’s Department deputy shot and killed while trying to serve papers on a mentally ill suspect. Hewitt’s widow was in attendance, as were a number of other family members. The playing of Taps and a the firing of three rifle volleys ended the solemn event.